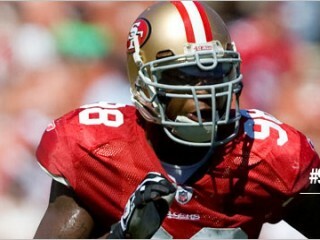 Parys Haralson registered another solid season for the 49ers, posting 5 sacks in 2009 to move himself into 4th place in career sacks by a 49ers linebacker (15.5), while also setting career highs in tackles (73), PDs (4) and FFs (1). Haralson had a breakout season in 2008, leading the team with a career-high 8 sacks, a total that t-2nd most among NFC linebackers and marked the most by a 49ers linebacker in a single season since Kevin Greene recorded 10.5 in 1997. His efforts were rewarded with a four-year contract extension through 2013 that spring. Originally a 5th-round (140th pick overall) draft choice by SF in 2006... Signed a four-year contract extension through 2013 on 4/16/09. •Parys’ diligent work ethic was instilled at the age of 14. While growing up in Flora, MS, his uncle and grandparents gave him an early introduction to life in the real world. He worked with his uncle at Sun Belt Bolts and Screws until he was 18 years old. After that, he labored in his grandfather’s junkyard. Parys says his family helped instill the blue-collar foundation he leans on now as an NFL player. “You had to have a hard work ethic because it was an 8-hour job in the hot Mississippi sun. Sometimes I didn’t want to go, but my grandparents made me go because if I didn’t work for what I wanted, they weren’t going to give it to me.” Those lessons taught Parys that good things don’t come without hard work and perseverance. •Led the team with a career-high 8 sacks in 2008, a total that tied for 2nd-most among NFC linebackers and marked the most by a 49ers linebacker in a single season since Kevin Greene (10.5) in 1997. •Ranked 4th on the team with 5 sacks. •Sacked QB Kurt Warner at Arz. (9/13) for a 6-yd. loss, and later pressured Warner into throwing an INT to CB Nate Clements in the 3rd qtr. •Tallied 8 tackles and tied a career-high with 2 PDs at Min. (9/27). •Pressured QB Jay Cutler into throwing an INT to S Dashon Goldson vs. Chi. (11/12). •Sacked QB Aaron Rodgers for a 12-yd. loss at GB (11/22). •Registered 1.5 sacks of QB David Garrard vs. Jax. (11/29). •Set a career high with 11 tackles, while registering a sack and his first ca­reer FF at Sea. (12/6). •Posted 57 tackles and 8 sacks. His sack total ranked t-2nd among NFC linebackers and were the most by a 49er since DE/LB Andre Carter’s 12.5 in 2002. •Had a career-high 2 sacks vs. Arz. (9/7). •Made first start of season vs. Phi. (10/12). •Tallied 3 tackles, 1 sack and 1 FR vs. StL (11/16). •Notched 5 tackles and 1.5 sacks vs. NYJ (12/7). •Stepped into starting lineup at OLB when Manny Lawson (knee) was injured prior to the third game of season. •Made first career start at NYG (10/21) and totaled a career-high 7 tackles. •Recorded 3 tackles and first career solo sack at Sea. (11/12) when he dropped QB Matt Hasselbeck for a 4-yd. loss in 2nd qtr. •Posted a half sack a piece vs. StL (11/18) and at Arz. (11/25). •Recorded 5 tackles in 7 games played as a reserve outside linebacker and special teamer before being placed on IR (11/7) with a torn pectoral muscle. •Played in first career game vs. StL (9/17) after missing most of training camp with a foot injury. •Three-year starter along defensive line at Tennessee, currently ranking 5th in school history with 21 sacks, topped only by Reggie White (32, 1980- 83), Leonard Little (28, 1995-97), Jonathan Brown (25, 1994-97) and Todd Kelly (22.5, 1989-92). Started entire senior season at left defensive end and earned second-team All-Southeastern Conference selection by the Associ­ated Press after recording 45 tackles, 3 FFs, 2 FRs and 8.5 sacks. •All-American selection as a senior at Madison Central (MS) HS. Also a two-time Class 5A all-state and three-time all-metro choice. •Helped Madison Central to a state title his sophomore season with a 15-0 record, while his junior (9-2) and senior (10-3) teams also advanced to the playoffs. •Born Parys Sharron Haralson (1/24/84) in Flora, MS.